In Telephones > Telephone Advertising > Show & Tell and Telephones > Telephone Signs > Show & Tell. Wow! awesome... how big is this? Its old - I would say between 1908 and 1921, because that was the Bell logo design then. It measures 4" across the bottom and approx. 2 3/4" across the top and is 4" tall. 5/16" thick. why hasn't ttomtucker posted here yet? I have seen these on Ebay and the seller claims that the buried cable marks are from the 1920's. Looking at the Bell logo it follows along the lines of the 21 Bell signs. This is a unusual buried cable marker. I just stumbled accross one of these this weekend. 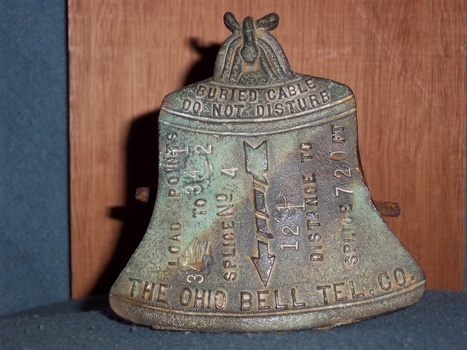 I actually found it camping and it was laying next to a concrete monument presumable placed by Ohio Bell company at the time. What a lucky find. I do not know any history on this item besides what is posted here. Does anyone have a value on this or is anyone interested?